Welcome to the new PuraVedaOrganics.com! All your favorite Teva Skin Care products are still exactly the same, only our name has changed. We are still working on the new site, but that won't affect your purchase experience. Let us know what you think! Disclaimer: This glossary is for educational and informative purposes ONLY. We do not sell component ingredient. ALFALFA EXTRACT - ANTIOXIDANTS ROCK! 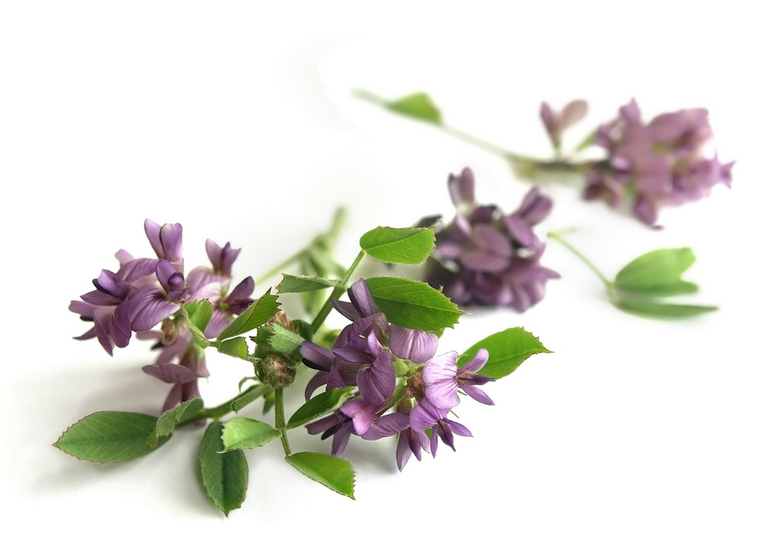 ALFALFA EXTRACT: (Medicago Sativa) Known as Mu-Su in Traditional Chinese medicine, Alfalfa made its way to China during the late Han Dynasty (around 2000 A.D.) from Persia. One of its most common uses in Chinese medicine is in the treatment of ulcers. Alfalfa Extract contains a broad spectrum of nutrients, including minerals and vitamins vitamins A, D, E, and K as well as saponins and chlorophyll. Here at PuraVeda Organics, we use Alfalfa extract as one of our many potent Antioxidants. Our Alfalfa source is USDA Certified Organic, and we steam distill the plant material in our lab for purity and standardized concentration of this powerhouse extract. ANTIOXIDANT DEFINITION: Antioxidants are just what the name implies, ie; they help reverse, slow down or prevent cellular oxidation. We call this cellular "rust," as oxidation is what causes even something as impervious as iron to degrade and break down over time. Imagine what it can do to your skin and hair. Actually you don't have to imagine, as the evidence for the aging process is all around us. When it comes to your skin, free-radicals damage, weaken and thin your collagen net, which is your skins major source of support and firmness, and drastically slow down cell turnover time, which is critical to younger looking skin. This cellular oxidation also causes the skin to lose elasticity and sag, as well as the ability to retain moisture. Age spots, depigmentation, wrinkles..the list goes on. Our philosophy is based in a belief that all serious skin care products should contain an arsenal of stable antioxidants to combat free radical proliferation and damage to your skin, help support your collagen net, elasticity and moisture levels.. In short, to bring you the most effective Anti-Aging Skincare possible in a topical format. 100% Organic Skin Care Product | Up to 60% Wrinkle Reduction| Best Day & Night Facial Treatment. Excessive sun exposure, especially at a young age, drastically increases the risk of skin cancer later in life. To combat this risk, those who enjoy spending time outdoors typically reach for commercial sunscreen products that are chock full of chemical ingredients. Crafted with high quality, natural oils, you'll be amazed at the long-lasting moisture that leaves your skin renewed and refreshed! Our Organic Bentonite Blemish Day Treatment uses the power of natural ingredients to target and conquer blemishes without damaging or aging your skin. Our Organic French Clay Blemish Night Treatment harnesses the cooling power of clay, natural oils, and herbs to soothe your angry blemishes fast. Give your skin the boost it needs while relaxing in the bath! Our Organic Pink Himalayan Bath Salts harness the power of minerals and herbs to detoxify the skin, restoring its youthful moisture and glow. Our Organic Aloe Daytime Eye Serum is the perfect weapon against fine lines and dryness around your eyes. Made with tested botanicals which revitalize and rejuvenate the eye area quickly, this fast-penetrating eye serum is sure to get your day off to a great start! It vanishes instantly and works as a light moisturizer all on its own! If you are looking for a serum with serious skin firming ability as well as the diminishing of expression lines and fine wrinkles, this is the serum you've been looking for. Fast penetrating, this treatment serum is a synergistic blend of vitamin-infused essential oils and concentrated botanicals. When absorbed deep into the dermal tissues, this serum restores and balances damaged skin by accelerating cell production. Our Organic Rosacea & Anti-Aging Serum goes on light and penetrates quickly to treat inflammation at the source. See improvement in this age-betraying area in just a few days with our Organic Overnight Eye Treatment Serum. Featuring a concentrated Ayurvedic formula designed specifically to boost your skin's natural production of collagen, this product will fight back against the free radicals that want to damage skin cells. Our Organic Hydrating Facial Toner For Sensitive Skin is brimming with Aloe Vera and essential oils to keep your skin moist. This product will help calm and soothe skin redness, and retrain hyper-reactive skin to minimize flare ups. Featuring active botanicals and sea minerals, this product soothes and heals while it cleanses and exfoliates. Specially formulated for oily and problematic skin, this product will help shrink your pores, balance the oil levels of your skin, and give your complexion a more even appearance. This refreshing facial hydrator and toner mist is specially designed for normal to dry skin types. Just a few spritzes a day will help balance moisture in the skin and give your complexion a more even appearance. Copyright © PuraVedaOrganics All Rights Reserved. Sign up for our Newsletter for the Latest in Skin and Hair Care, Beauty Fixes, and Fantastic Exclusive Newsletter-only Weekly Discounts. Sign-Up!